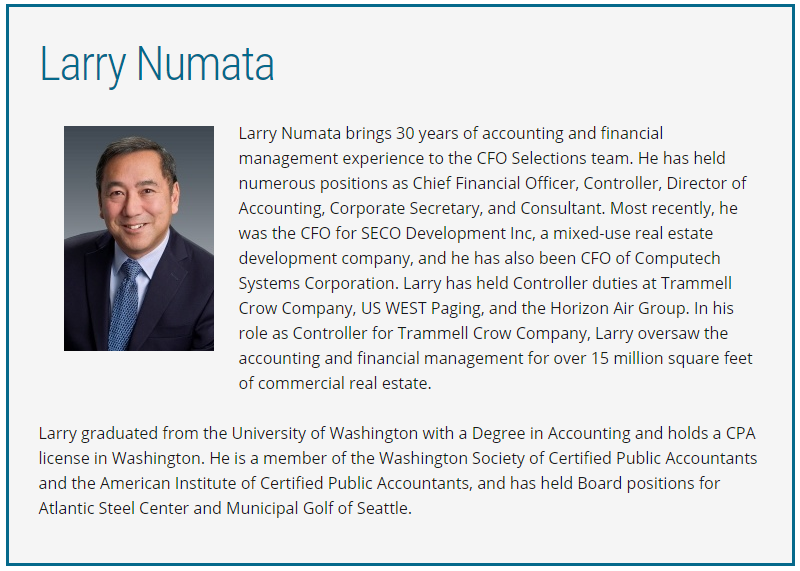 Larry Numata brings 30 years of accounting and financial management experience to the CFO Selections team. He has held numerous positions as Chief Financial Officer, Controller, Director of Accounting, Corporate Secretary, and Consultant. Most recently, he was the CFO for SECO Development Inc, a mixed-use real estate development company, and he has also been CFO of Computech Systems Corporation. Larry has held Controller duties at Trammell Crow Company, US WEST Paging, and the Horizon Air Group. In his role as Controller for Trammell Crow Company, Larry oversaw the accounting and financial management for over 15 million square feet of commercial real estate. Larry graduated from the University of Washington with a Degree in Accounting and holds a CPA license in Washington. 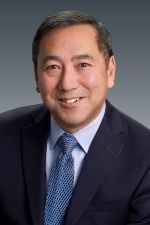 He is a member of the Washington Society of Certified Public Accountants and the American Institute of Certified Public Accountants, and has held Board positions for Atlantic Steel Center and Municipal Golf of Seattle.